EAT.DRINK.THINK. : PDX Quick Bites: Ping; Koi Fusion; + coffee, carts, bars, and Taboada's, oh my!! PDX Quick Bites: Ping; Koi Fusion; + coffee, carts, bars, and Taboada's, oh my!! After a recent lunch at Ping with my friend's Denise and her man K I asked on a twitter post if anyone else was as underwhelmed with Andy Ricker's Ping as I am? This place opened with great hype, riding the PDX Asian street food wave created by his much better Pok Pok. Both times I have been to Ping I am always kind of "meh". Okay, so where are all these amazingly creative, vibrant flavors? From what I hear about Thai street food, you can have fireworks going off in your mouth. Ping is like a sparkler that gives you a minor thrill, then fizzles. It seems it has been dumbed down for local consumption. 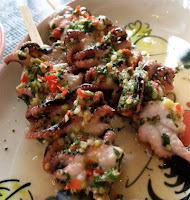 Some things I like: the octopus skewer (below right) was nicely al dente with the requisite fire. The meat stuffing in the pork bao (pic at top) was very flavorful, but the bun surround was too chewy (and not a good deal at $4 each). The other things were....nice...but seemed to lack spark. And finally, I have to join the chorus that goes "what the hell is up with the skewers HAVING to be ordered by the 2 each?" If I'm by myself, maybe I only want one skewer so I can try more things. Would the orbit of the Ping kitchen really come to a screeching halt if they had to put out...gasp...one skewer?!? And I have to say, the few small bits of over-cooked lamb on that skewer for $6 (oh, wait, I meant $3 each as they are listed on the menu, but you have to order 2...*#@!%^) were not a terribly good deal...or a just plain terrible deal. The greater mystery is how can Pok Pok be so good, and this place not so much? Answers, anyone?? So, with being less than satisfied with the Ping lunch, Denise and I (sadly K had to go back to work) wandered a couple blocks down to Burnside and 4th, where the roving Koi Fusion Korean taco cart was parked for the day. In the food media world it seems you can't throw a tortilla without hitting an article about Korean taco carts. It started with the Kogi carts that are the hottest thing in L.A. dining. Koi owner Bo Kwon, inspired by a visit to Kogi decided to give us a Portland version. The Koi marinated meats are delicious. Fresh made corn tortillas, creative Asian style topping, and tender, very flavorful Bulgogi tacos and my favorite, the Korean Short Rib tacos are fantastic at $2 each (hello Ping? $2 each, and I can order ONE if I want). Both marinated in what their website calls "Mama Kwon’s secret sauce" they were spicy, savory, and sweet....and delicious! We also tried the spicy Bulgogi pork taco, which could have used a lot more seasoning. I can't wait to go back and try the two beef tacos again, as well as the Seoul Sliders, which are tacos with "Bulgogi BBQ beef, shredded napa cabbage, griddled onions, crisp bean sprouts and spicy mayo". You can find out where to get your Koi on by checking their twitter feed, and it is totally worth the chase! TASTY BITS: A double shot of good news for those who like to get their caffeine high going. I was hanging outside the Spella Caffé coffee cart downtown, swilling another of owner Andrea Spella's perfect double espressos, when I found out he is opening a store at SW 5th and Alder that he hopes to have going by Dec. 1st. Great coffee without the raindrops falling on my head? I am so in!.....The other coffee shot is the news flash that Billy Wilson, owner of Barista coffee in the "Pearl", dropped on twitter yesterday that he has just signed a lease for a space on NE Alberta. Billy is a fanatic about sourcing high quality organic coffee from small boutique roasters around the U.S., and his drinks, as you'd expect from a champion barista, are top notch. Add Pok Pok: It was written up in our local fishwrap that Pok Pok/Whiskey Soda Lounge owner Andy Ricker is opening a bar just kitty corner from his always rocking spot on SE Division, so us poor bastards who wait outside in all kinds of weather can have a warm, dry place inside to get some alcohol fueled warmth and a few tasty bar snacks. The new space will become Whiskey Soda Lounge and Pok Pok across the street will be just that. Just opened in my Sellwood 'hood (and conveniently just across the street from the wine shack) is a new food cart called Bruce Lee Kitchen. 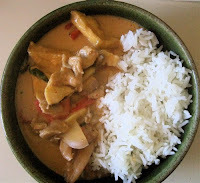 I've checked out their phat thai and red curry, both around $5 and $6, and was really impressed. The phat thai isn't quite a classic style, being somewhat spicier than your normal version, but it was bursting with fresh flavor. And I was even more smitten with cart owner Liza's red curry (pic at left), which was a deep, rich, lightly creamy and pungently flavored blast of palate pleasure. Great values, and an excellent compliment to the goodness always coming out of the Garden State cart which sits right next to BLK. My life continues to receive many tasty blessings! Portland Monthly blogger Mike Thelin mentioned in his post Monday that Navarre's John Taboada is opening another space just down from Navarre on 22nd and E. Burnside he is going to call Luce (pron. loo-chay). It's a two room spot, one of which will house a large commercial kitchen, the other a spot Taboada hopes to turn into a dining room event space seating up to 60 people (a la Beast?). Taboada, whose Navarre was named "Restaurant of the Year" by The Oregonian last year, cagily says he should be open "Soon". I have been to Ping twice and thought the food was great. The skewer rule is weird, but not so bad that it warrants a dropping of the F-bomb. That should be reserved for people who have not contributed to Portland's food culture as much as Andy has. anon...okay, maybe the f-bomb was too strong. I toned it down. I'm glad you've had good experiences. I wish I had. And Andy has contributed a ton to the food culture here, and all due respect for that and for showing us new food and flavors. That is why I am so baffled as to the seeming lack of spark at Ping. I go in wanting to love a place, especially in Portland...and especially when it looks as simultaneously warm and cool as Ping. But the food (and prices) just don't measure up. And that skewer situation: are they trying to trick customers on price? If they weren't so miniscule would they be so DRY? These and other burning questions made me actively resentful (though I wouldn't pass up an overpriced steamed bun if I was in the neighborhood). Went to Koi Fusion and found the short rib taco sublime. And stellar (heh!). Not so much the kimchi quesadilla…just give me the kimchi on the side and I'll be happy. As for Ping, my reaction was "meh" as well. Too much see-and-be-seen, not enough eat-and-be-eaten. 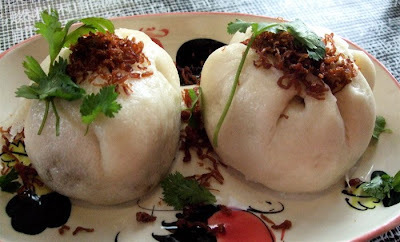 dds....I wouldn't pass up an overpriced steamed bun in any neighborhood...as long as it tasted good. I think shredded kimchee on top would be upping the ante in all the right ways. KAB...glad you had the koi experience. I was curious about the quesadilla. I may still have to try it...ya know, just for research sake! And I just read on twitter that Ping is where whoever was hosting Ruth Reichl took her for lunch. Talk about a place to see and be seen...or scene. Never tried Ping, but Wandering Chopsticks and I did Pok Pok when she was here recently. To be honest we weren't all that impressed. I mean, the food was fine, but not spectacular. One thing that was weird was the "refinement" of the food. Refining street food takes something away from it. Sure, I'd go back, but I wouldn't take my mom. I wouldn't hear the end of it. Koi Fusion is the bomb! I'm at PSU 3 days a week and have it for lunch all the time. And I've preached about it nonstop to my classmates, which is annoying because the wait is now longer. But I'm glad they are successful. I'd hate to see them disappear. 2Pok is up and down I know. Not as bad as Ping, though. That's cool that you got to hang with WC, too....how fun! Eat anywhere notable? Totally agree about Koi....they are really nice and deserve the success. I've only been once, but will be going back this Monday! The last couple of times she was in town, we did the Vietnamese place that does the daily soups. I'm such a tool because I can't remember the name or where it's located (somewhere on or near SE 82nd)even though I was the driver. WC basically gave me directions but we were always talking so I never paid attention. Any, it's been written up in Mix and the Oregonian and everyone seems to know which I'm talking about but no one seems to remember the name either. And the really funny thing is I took their to-go menu and it doesn't have their name or address anywhere on it, only the phone number! Anyhow, we've had a couple of their soups and they were really good. But once they sell out, they are done with soups for the day.